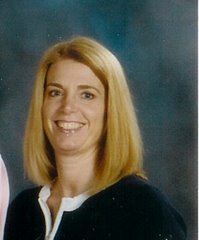 I used to have a list on my sidebar indicating what book I was reading now and what books were standing in line. I finally gave up and removed that list because I choose books by mood and not by list. Most of the time anyway. This "What's On My Nightstand" meme forces me to share what's on the docket for now and this meme I can do. Since the rules about what I discuss here are flexible, you'll not always hear about what it is I'm reading now. But for this go around, I will. 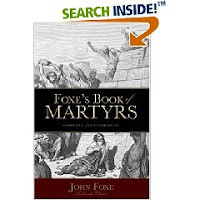 Currently I am in the middle of reading Foxe's Books of Martyrs because I think it's important to the Christian faith. I still think so. However, I cannot say that I am enjoying it. Really not very much at all. I have an interesting review of it revolving around in my brain so stay tuned. I used to read several books at once but as I got older and my son became more "distracting" I found that I had to narrow down the pile and only read one book at a time. This boosts concentration levels. That being said! Foxe's Book of Martyrs was putting me in quite a funk so I broke my newly established rule and picked up a book on the fly, knowing absolutely nothing about it, and hoped for the best. 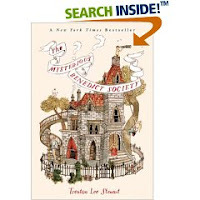 I picked up two copies of The Mysterious Benedict Society, by Trenton Lee Stewart, this past week. One copy for me, and one copy for my mom who was visiting (and is also an avid reader). It is very fun. And I'm discovering it is kinda dark. I can't really say whether this is going to be a book that I hands down LOVE, despise or have raised eyebrows about. You can chalk me up for a "tentative like" but check back. I'm sure I'll have lots to say about it. It demands a lot of thought and I don't want to jump the gun and presume anything that isn't so. So there you have it, folks! Those books are what are on my "nightstand" at present. Now I'm looking forward to hearing about what's on yours! I'm the same way--reading by mood, but I like to think that I know what I'll be reading next. The Mysterious Benedict Society is sitting on my shelf -- recommended by a friend -- but I haven't so much as cracked open the cover. I was thinking I'd read it with my 9-year-old son, but I'm wondering if I should read it first, to kind of preview it, or if we can jump right in together. What would you recommend? I've always thought I needed to read Fox's Book of Martyrs because of Anne of Green Gables did. :) Still haven't gotten to that one yet! I remember reading Foxe's Book of Martyrs around eighth grade-ish. (Yeah, we won't say how long ago that was!) I remember it being a drag, but I gained an appreciation for what it means to die for your faith. I've seen The Mysterious Benedict Society when brosing at B&N. It caught my eye, but I was not sure if it would be trash or treasure. Looking forward to your review. I agree it's hard to read about martyrs but important to our Christian faith. That's why I liked Safely Home so much, as it is about martyrs but in a way in which we can relate. I'll have to read your review of Safely Home, one of my favorite books. That is also how I read. Whatever I feel like reading next.. I think that is probably why I have bookshelves full of books I haven't read yet that I picked up saying oooo I want to read this next. Good Luck with Foxe's book of Martyrs.. sounds like a tough read. For a book club I am in we read The Confessions by St. Augustine and I had the same feeling on that one as you do on Foxe's book. However, after the fact I was glad I plowed through it. 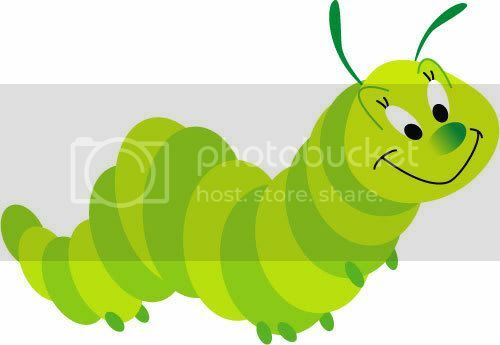 Hey... I posted my Nighstand list...but where do I link to it on the 5 Minutes site? I'm a bit confused. Can you help? Ok, I applaud you for reading Foxe's Book of Martyrs. I tried to read it once... I just couldn't. Ugh... I look forward to your review... who knows you might convince me to read it afterall. Ok, this is really funny. I've run into The Mysterious Benedict Society twice now and if I count your blog that makes it three times. I have a rule when it comes to books. If I see a book three times and each time I pick it up with curiosity I have to get the book the third time. I look forward to your review and I'm adding it to my to read list. I have an active one year old boy, I neeeeeeed coffee. I would imagine the martyrs book is not exactly light nighttime reading! Still, like you say it is important to read - Fiona Cook has written quite a number of good books on the "lesser known" Christians (not necessarily martyrs) - I have read a few and they are really challenging! I tried I really did to get through Fox's Book of Martyrs. Maybe I should try again. I've never read either. Thanks for sharing something new with me! Foxe's needs to be taken slowly that is for sure...story by story seems to work best. Helps us to keep our Christian life in perspective. I actually think reading about martyr's is very beneficial instruction for believers :)!